I was talking to a friend last week who recently purchased a new car. She mentioned that she was pleasantly surprised to receive a personal email from her salesperson; following-up on her purchase and asking her if she was enjoying the car and/or if she had any problems or questions. This got me thinking about my recent car purchase. For my friend, that quick email made her feel more comfortable and warm toward that brand, dealership and specifically that salesperson. Most importantly, she is now serving as an organic word-of-mouth-marketer – telling more people about her new car, dealership, and post-purchase follow-up and recommending that car, dealership, and salesperson to others in the market for a new car. The best thing about the email that my friend received was that it wasn’t all about sales, rather quite the opposite. Post purchase follow-up gives companies a great opportunity to provide value to customers, garner feedback, and improve post-purchase satisfaction and create an overall positive customer experience. Here is a great example of how one salesperson followed up with a handwritten note (and check out the comments for other good examples). Of course, a handwritten note or personal email may not be feasible for every company. For example, if your entire purchase process is executed online and you never interact with anyone, it would be quite hard for the company to send out a personalized note. If, however, I’m spending several hours directly with a salesperson (or in my case, 6 hours), I don’t think a short email is too much to ask for. 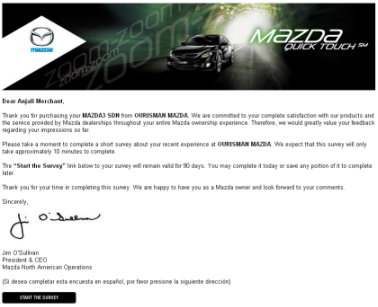 If I had received a quick call email from my salesperson you better believe I would be referring people to that dealership/salesperson and I would be more far more inclined to become a loyal Mazda customer and repeat buyer myself.